Multi-detector CT reliably permits visualization of coronary arteries, but due to the occurrence of motion artefacts at heart rates >65 bpm caused by a temporal resolution of 165 ms, its utilisation has so far been limited to patients with a preferably low heart rate. We investigated the assessment of image quality on computed tomography of coronary arteries in a large series of patients without additional heart rate control using dual-source computed tomography (DSCT). DSCT (Siemens Somatom Definition, 83-ms temporal resolution) was performed in 165 consecutive patients (mean age 64 ± 11.4 years) after injection of 60–80 ml of contrast. Data sets were reconstructed in 5% intervals of the cardiac cycle and evaluated by two readers in consensus concerning evaluability of the coronary arteries and presence of motion and beam-hardening artefacts using the AHA 16-segment coronary model. Mean heart rate during CT was 65 ± 10.5 bpm; visualisation without artefacts was possible in 98.7% of 2,541 coronary segments. Only two segments were considered unevaluable due to cardiac motion; 30 segments were unassessable due to poor signal-to-noise ratio or coronary calcifications (both n = 15). Data reconstruction at 65-70% of the cardiac cycle provided for the best image quality. For heart rates >85 bpm, a systolic reconstruction at 45% revealed satisfactory results. Compared with earlier CT generations, DSCT provides for non-invasive coronary angiography with diagnostic image quality even at heart rates >65 bpm and thus may broaden the spectrum of patients that can be investigated non-invasively. Due to its high spatial resolution, multi-detector computed tomography (MDCT) allows non-invasive visualisation of the coronary artery lumen and thus a reliable and reproducible detection of significant coronary artery stenoses in native coronary arteries as well as coronary bypass vessels [1, 2, 3, 4, 5]. Particularly its high negative predictive value to rule out coronary artery disease (CAD) has positioned MDCT in the current ESC guidelines on management of stable angina as recommended for patients with a low pre-test probability of CAD and inconclusive stress testing . Task force guidelines for training in coronary MDCT have recently been published in order to standardise the CT protocol as well as post-processing techniques . However, coronary calcification and most notably cardiac contraction with rapid motion of the coronary arteries limit non-invasive coronary angiography using MDCT . In the past this resulted in impaired image quality due to motion artefacts in patients with heart rates >60 beats per minute (bpm) [9, 10], and therefore, image quality in up to 35% of all patients examined was inadequate for analysis under use of a 16-slice MDCT-scanner [11, 12, 13, 14]. Under application of 64-slice MDCT with an improved temporal resolution of 165 ms, motion artefacts still occur at elevated heart rates and consequently may impair diagnostic accuracy [15, 16, 17]. Until present, it is common practice to administer oral and/or intravenous beta-blockers to decrease the patient’s heart rate below 65 bpm [18, 19, 20, 21], while still up to 12% of coronary artery segments are not suitable for evaluation . Besides multi-segment reconstruction algorithms, which combine data sets from two or even more cardiac cycles for reconstruction resulting in improved temporal resolution, dual-source technology is a further approach for improving temporal resolution in coronary CTA. By using two X-ray tubes mounted onto one single gantry at an angle of 90° as well as two corresponding detectors, a duplication of temporal resolution from 165 ms up to 83 ms is provided. This may avoid the need to slow the HR, and in addition beat-to-beat R wave variation does not affect coronary position if partial sub-segmental image reconstruction is used [22, 23]. Recent studies using dual-source CT technique (DSCT) have shown encouraging results in visualisation of coronary arteries independent of actual heart rate, but only small numbers of patients were included [24, 25, 26]. The aim of this retrospective study was to determine the feasibility of non-invasive coronary artery angiography using DSCT in 165 unselected consecutive patients without heart rate lowering premedication. Over a 3-month period, 165 consecutive patients were included in our study; 116 were male, 49 female, and mean age was 64 ± 11.4 years (range 39 to 85 years, Table 1). For inclusion, a clinical indication for coronary angiography (e.g., atypical chest pain, dyspnea), sinus rhythm and a preserved renal function (serum-creatinine ≤1.4 mg/dl) as well as the absence of hyperthyroidism and previous reaction to iodine-containing contrast agents was mandatory. We excluded patients younger than 35 years, with coronary bypass grafts or suffering from atrial fibrillation. Patients with implanted coronary stents were not included because DSCT technology does not overcome the limitation of beam-hardening artefacts caused by the stent material. All patients gave written informed consent for the study, which furthermore was approved by the local ethics commission and adheres to the declaration of Helsinki. All patients were examined using a DSCT CT system (Somatom Definition®, Siemens Medical Solutions, Forchheim, Germany) placing each patient exactly centrally in the CT gantry; no heart rate modulation by administration of beta blockers was performed in any patient before CT, but 87 patients (52.7% of all patients) were under continuous beta-blocker medication. Of these 87 patients, 51 were on continuous therapy with metoprolol (24 at daily dose of 47.5 mg, 17 at daily dose of 95 mg, 6 patients received 132.5 mg per day and 4 patients had 180 mg per day, respectively). Twenty-six patients received a continuous medication of bisoprolol (15 patients had 5 mg of bisoprolol daily and 11 had a daily dose of 10 mg of bisoprolol, respectively), and a total of 10 patients were on a continuous therapy of 5 mg of nebivolol daily. After placing an 18-G intravenous catheter into an antecubital vein, and placing the ECG electrodes in standard position, all patients received 0.8 mg of glycerole trinitrate sublingually immediately before CT. Initially a topogram for planning purposes and an unenhanced CT acquisition for calcification scoring (64×0.6 collimation, variable pitch of 0.2–0.43, depending on heart rate; reconstructed slice thickness 3.0 mm, reconstruction kernel B35f, respectively) were obtained. A test bolus approach was performed determining the contrast agent transit time (10 ml of iopamidole, containing 370 mg iodine/ml, followed by 50 ml of isotonic saline, both at 5 ml/s) by calculating the time between beginning of the contrast agent injection and maximum enhancement in the ascending aorta. For optimal contrast enhancement of the coronary arteries, the total delay was calculated by adding an additional time delay of 2 s. CT angiography was then performed after injection of 60–80 ml of contrast agent at 5 ml/s, followed by 50 ml of saline. 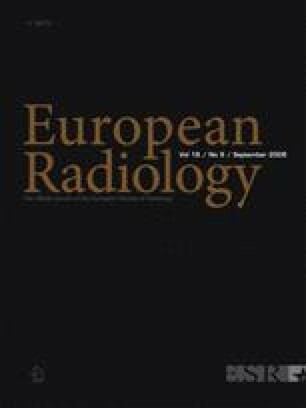 The exact amount of contrast agent to be injected was calculated by the expected duration of CT data acquisition and thus varied between different patients. Data acquisition was performed from the level of the tracheal bifurcation to the diaphragm in cranio-caudal direction using a detector collimation of 32×0.6 mm and slice acquisition 64×0.6 mm by means of a z-flying focal spot. Gantry rotation time was 330 ms; pitch was 0.2–0.43, respectively. Tube current was adapted automatically to each patient’s weight using CareDose 4D® automatic exposure control and a reference tube current of 320 mAs for the coronary angiography. Tube voltage was 120 kV for both tubes; the ECG pulsing window was fixed to 35–70% of the RR interval for all patients. Data sets were reconstructed on a dedicated workstation (syngo® workplace, Siemens Medical Solutions, Forcheim, Germany) using a single RR- interval reconstruction approach, resulting in a temporal resolution of 83 ms ; for synchronization of data reconstruction with the ECG signal, retrospective gating was performed. Image reconstructions were rendered in 5% increments from 35 to 70% of the RR cycle; according to the reconstructed images, a slice thickness of 0.6 mm and an increment of 0.3 mm were chosen. All data sets were presented in a random order to two observers, who were blinded to the patients’ clinical data and CT parameters. They decided in consensus which reconstruction was of best image quality and therefore was used for further evaluation. After evaluation of axial and oblique multiplanar reconstructions (MPR), also oblique maximum intensity projections (MIP) were rendered as well as curved multiplanar reconstructions (curved MPR) and three–dimensional volume-rendering technique projections (VRT). All images were evaluated as to the visibility and evaluability of the coronary arteries as well as to the presence of motion and beam-hardening artefacts. Concerning artefacts, presence or absence as well as evaluability in general was noted for each coronary segment using the modified AHA 16-segment model, with segment 16 representing a right posterolateral and segment 17 intermediate branch if present . Quantitative variables were described as mean ± standard deviation; categorical variables were presented as counts and percentages. Calculating the p-value for comparing CT datasets preferably reconstructed at 65% of the RR cycle with those optimally reconstructed at 70% of the cardiac cycle Student’s T-test was used. All CT procedures were performed without complications. Mean heart rate during CT data acquisition was 65 ± 10.5 bpm (minimum 46 bpm, maximum 115 bpm, Table 1). A total of 2,541 coronary segments were included into our study, of which 2,509 were considered assessable (98.7%); 32 coronary segments were considered unevaluable by two expert readers in consensus (1.3%). Of these 32, only two (6.3%) were affected by motion artefacts due to multiple ventricular premature beats that could not be sufficiently edited because the ECG pulsing window had not been extended prior to the scanning procedure. These two segments were distributed among two patients who had a heart rate of 56 bpm and 60 bpm, respectively. That means only 2 of 2,541 coronary segments were considered unevaluable due to motion artefacts (0.08%), whereas 2,539 segments could be visualized free of motion artefacts (99.9%, Table 2). Fifteen coronary segments were considered unevaluable due to severe obesity leading to a significant lack of contrast caused by poor signal-to-noise ratio. Patients with coronary segments unassessable due to severe obesity had a mean body mass index (BMI) of 34.3 ± 6.2, whereas the mean BMI of the overall patient population was 28.5 ± 4.6 (Table 1). Furthermore, coronary calcifications caused insufficient assessability in another 15 coronary segments (Table 2). These patients had a mean Agatston score of 1,147 ± 722 (minimum 105, maximum 2,398); the mean Agatston score of all patients included in our study was 30 ± 504 (minimum 0, maximum 2,398). Overall a total of 13 patients (7.8% of all patients included) had unevaluable coronary segments. These patients were distributed into four individuals with segments unassessable due to bad signal-to-noise ratio, two patients with ectopic premature beats that could not be edited and seven patients with at least one coronary segment unevaluable due to calcifications, respectively (Table 3). As the number of different time instants necessary to achieve diagnostic image quality was 1 ± 0.4, the optimal time point for reconstruction of raw data to achieve diagnostic image quality proved to be 70% of the RR cycle (Fig. 1), with the majority of data sets (n = 84; 51%) reconstructed at a wide range of heart rates (mean heart rate 65 ± 5.7 bpm, minimum 55 bpm, maximum 84 bpm, Table 2). For heart rates of <60 bpm, a reconstruction at 65% of the RR interval offered also sufficient results (n = 65; 39%). In this regard, data sets with best image quality at 65% of the RR cycle were obtained at a significantly lower heart rate than those gained at 70% of the cardiac cycle (mean heart rate 57 ± 4.5 bpm, minimum 46 bpm, maximum 64 bpm; p < 0.0.5 for 65% compared to 70%). For heart rates >85 bpm, a reconstruction of raw data in systolic phase (45% of the RR interval) provided better image quality than reconstructions in diastole (n = 16, mean heart rate 85 ± 14 bpm) and thus offers an alternate reconstruction interval at higher rates if image quality is not sufficient in diastolic reconstructions (Fig. 2). This study demonstrates that improved temporal resolution with DSCT allows motion artefact-free visualisation of the coronary arteries in a large cohort of patients without precedent heart rate control: 98.7% of all segments were assessable in our study, although this is a feasibility study, and no further selection of patients examined was performed. While 30 segments each were considered unassessable due to calcifications (15 segments) or poor signal-to-noise ratio (15 segments), only two out of 2,541 coronary segments were unevaluable because of motion artefacts (premature beats). We found that in a wide range of heart rates a reconstruction at 70% of the cardiac cycle leads to images of diagnostic quality, which is in agreement with data of Achenbach et al for DSCT . In addition, a raw data reconstruction at 65% of the RR interval for bradycardic patients with a heart rate of <60 bpm as well as a systolic reconstruction for patients with heart rates >85 bpm reveal sufficient image quality, which are both well known from data set reconstruction using 64-slice MDCT . The introduction of the DSCT with improved temporal resolution is not accompanied by an improvement of spatial resolution in comparison to 64-slice MDCT. Thus, heavily calcified coronary segments or distal parts of coronary arteries are still difficult to evaluate and may lead to false-positive results in quantification of significant stenoses, which amongst others has been demonstrated by Scheffel et al. . In the study by Scheffel et al., 76.4% of all coronary segments with an Agatston score ≥400 were of reduced evaluabilty because of beam-hardening artefacts due to calcifications. In addition, minor to moderate motion artefacts in 68.2% of all patients with a heart rate of ≥70 bpm slightly impaired assessment of the coronary segments. The number of patients included in that study is small (n 0), and it has to be mentioned that contrary to the recommendations of the European Society of Cardiology for the indication to perform CTA, the pre-test probability for CAD was high as well as the Agatston score (mean 821), which leads to a significant decline of diagnostic accuracy  and is reflected by the high number of false-positive results (n = 9). Since motion artefacts have been a major limitation for CT coronary angiography using earlier generation MDCT [10, 11, 12, 13, 17], an improvement of temporal resolution to actually 83 ms broadens the spectrum of patients potentially suitable for non-invasive coronary angiography due to dispensability of heart rate-lowering premedication and significantly improves diagnostic image quality at heart rates >65 bpm [24, 25]. However, this conclusion has been drawn so far from studies with small patient numbers  and mostly without correlation to invasive coronary angiography [24, 25]. Radiation dose exposure is an important issue on coronary CT angiography. For dose reduction, further conclusions can be drawn from our study according to the modulation of the ECG pulsing window in relation to the patient’s heart rate: Since the majority of data sets obtained at heart rates below 85 bpm may be reconstructed in a small RR interval from 65% to 70% of the RR cycle, a diminution of the ECG pulsing window to an exclusively diastolic interval for heart rates, e.g., below 80 bpm, still provides for images of diagnostic quality and reduces radiation dose exposure. The feasibility of this approach is currently under investigation . Reduction of radiation dose exposure is also one of the main issues of coronary CTA using prospective ECG triggering. First experiences have shown encouraging results on artefact-free visualisation of coronary arteries at low radiation doses. However, image quality is inversely related to heart rate and up to 14.8% of coronary segments are unevaluable at heart rates >63 bpm . In terms of evaluability of coronary arteries at elevated heart rates, prospectively triggered coronary CTA is inferior to both retrospectively gated dual-source and single-source 64-slice MDCT. In this regard it has to be taken into account that multi-segment reconstruction techniques are only feasible using retrospective ECG-gating. Careful selection of patients referred for non-invasive coronary angiography may thus be an important issue on coronary CTA in the future: Prospective ECG triggering as the technique of choice for patients at low heart rates, DSCT under use of retrospective ECG-gating as an alternative for patients at elevated heart rates and ineligible for beta-blocker pre-treatment. We have to acknowledge several limitations of our study: As a feasibility study, an important limitation of our study is that correlation to quantitative invasive angiography could not be provided and thus is not presented here. An intraindividual comparison to different types of CT scanners was not performed either. In agreement with other studies on DSCT [24, 25, 26], multi-segment reconstruction was not used in our study to optimise image quality in even higher heart rates. Since this study was performed early after the release of the DSCT scanner technology, the concept of motion maps was not implemented in our study. These software tools automatically generate most quiescent phases during the RR cycle by calculating a motion strength function among several reconstructions at low resolution over the cardiac cycle and identify periods of low differences between neighbouring phases. This postprocessing allows fully automated determination of optimal reconstruction time instants, and thus appears to facilitate image reconstruction . In conclusion, our data confirm the ability of the new DSCT to visualize 99% of coronary segments without motion artefacts independent from heart rate in a large patient collective without heart rate-lowering premedication. However, further studies are warranted including patients with atrial fibrillation or extra-systoles.